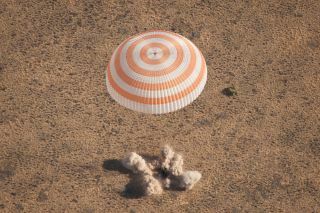 The Soyuz TMA-21 spacecraft is seen as it lands with Expedition 28 Commander Andrey Borisenko, and Flight Engineers Ron Garan and Alexander Samokutyaev in a remote area outside of the town of Zhezkazgan, Kazakhstan, on Friday, Sept. 16, 2011. A Russian-built Soyuz space capsule landed safely back on Earth late Thursday (Sept. 15), returning an American astronaut and two cosmonauts home after more than five months in space. The Soyuz TMA-21 spacecraft touched down at about 11:59 p.m. EDT (0359 GMT), though it was 9:59 a.m. Friday local time at their landing site on the steppes of Kazakhstan in central Asia. Russia's Mission Control center in Moscow lost direct communications with the Soyuz during its descent through Earth's atmosphere, but the glitch apparently did not affect the spacecraft's normal landing operations. "A bull's eye landing for the Soyuz TMA-21 spacecraft," said NASA spokeman Rob Navias during the agency's landing commentary. Earlier, Navias said a recovery team aircraft was able to contact the Soyuz crew and confirmed that its crew was doing well during the descent. "It's been great sharing space with you," space station commander Mike Fossum of NASA told the departing crew just after the Soyuz undocked. "Safe journey and soft landing, my friends. Godspeed from the International Space Station." American astronaut Ron Garan (center) and his two Russian crewmates Alexander Samokutyaev (waving) and Andrey Borisenko bid farewell to the International Space Station on Sept. 15, 2011 before undocking from the outpost and returning to Earth. Garan and his Russian crewmates launched on April 4 just ahead of the 50th anniversary of the first human spaceflight by famed cosmonaut Yuri Gagarin on April 12, 1961. April 12 was also the 30th anniversary of NASA's space shuttle program. The spaceflyers marked the 50th anniversary of the first American spaceflight (by Mercury astronaut Alan Shepard on May 5, 1961) from orbit. Their flight also included NASA's final two space shuttle missions — one in May and another in July — which delivered a major astrophysics experiment and vital supplies to the orbiting lab. "Thanks 4 being w/me on this amazing journey," Garan wrote. NASA retired its space shuttle fleet after 30 years of flight to make way for a new program aimed at deep space exploration using new capsule-based vehicles and a giant rocket called the Space Launch System, which the U.S. space agency unveiled on Wednesday. Currently, NASA is relying on Russia's Soyuz rockets and spacecraft to launch astronauts into space, though the agency plans to use new privately built U.S. space taxis to send Americans into orbit once they become available. NASA astronaut Ron Garan is all smiles after landing back on Earth aboard a Russian Soyuz TMA-21 spacecraft following a 5 1/2-month mission to the International Space Station. Garan and two cosmonauts returned to Earth on Sept. 15, 2011. Garan, Borisenko and Samokutyaev made up part of the Expedition 28 crew of the International Space Station, with Borisenko commanding the mission. On Wednesday, Borisenko turned control of the space station over to Fossum, who now leads the outpost's Expedition 29 mission. Russian cosmonaut Sergei Volkov and Japanese astronaut Satoshi Furukawa also remain aboard the station. The three men will remain in space for the next three months. Meanwhile, another three-man crew is preparing to launch toward the space station. A Soyuz 28 spacecraft carrying NASA astronaut Daniel Burbank and cosmonauts Anatoly Ivanishin and Anton Shkaplerov is set to launch from Kazakhtan's Baikonur Cosmodrome on Nov. 14 and arrive at the space station two days later. The Soyuz 28 spaceflight was delayed from a late September liftoff following the failed launch of a Russian Soyuz rocket carrying an unmanned space station cargo ship last month. A malfunction in the gas generator in the Soyuz rocket's third stage engine caused the failure. The Soyuz and its cargo ship, called Progress 44, ultimately crashed in Siberia. Since the Progress 44 cargo ship launched on a Soyuz rocket similar to that which will carry the Soyuz 28 crew, NASA and Russia's Federal Space Agency agreed to ground all station-bound flights until the cause could be determined.